Editors often want to be able to preview their content as it will appear on the site, before making it live. Some of our publishing tools support this – for example Whitehall Publisher – but they’re not very consistent, and many of them don’t support it at all. As part of the technical rework we’re doing behind the scenes, we’ve been gradually migrating all of the publishing tools to a new publishing architecture. Generally this means no changes for editors and end users, and for the most part the migrations go without notice, but one advantage of the new architecture is that enables a consistent way of providing on-site content previewing. Clicking on this link will take you to the draft site, which provides a complete representation of the document as it will appear once it’s live on GOV.UK. Pages are watermarked as 'draft' to give a visual indication that this is not the live site. In Specialist Publisher, specialist documents can only be viewed by members of the owning organisation before publishing. That access limiting is carried over the to the draft site, where you’ll need a login associated with the relevant organisation before you can view the documents. Manuals are not access-limited in either the tool or the draft site. For now, only a few formats are sending their data to the draft site, so if you click around outside the document you’re previewing you’ll probably see some errors. Eventually, though, as more publishing tools and formats are converted to the new architecture, the draft site will become a full representation of the site with all content ready to be published, as well as existing published content. 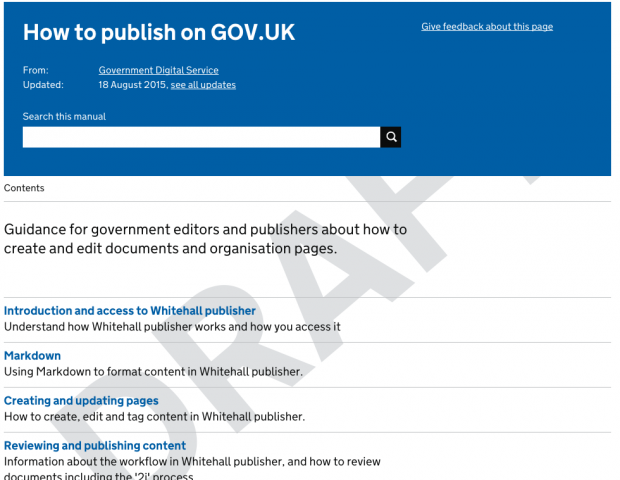 Are there plans to let people who don't have publishing rights preview content created in whitehall publisher? We can do this for mainstream content, but not for departments and policies content. Yes, the new draft preview site allows users without publishing rights to preview content, as long as they have some kind of sign-in access and the content isn't access limited. When the new architecture is rolled out to all Whitehall formats this will become available there.